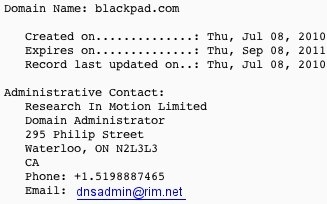 RIM registers the domain name BlackPad.com | BlackBerry Blast! Research in Motion may have just dropped a big hint about their upcoming tablet plans. As the screencap clearly shows, the company registered the domain blackpad.com on July 8, 2010. This doesn't tell us much that we didn't already know, except the name of course. It looks like RIM is following Apple's lead in referring to their tablet as a "pad." Will it work on it's own? Will it simply be supplemental to a BlackBerry? Stay tuned.